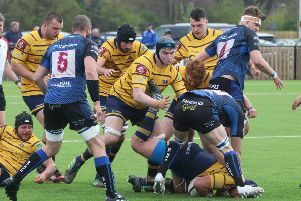 Worthing Raiders will be looking to bounce back from their defeat to Clifton when they face Bormingham and Solihull on Saturday. Raiders lost 37-15 to Clifton and assistant coach Ben Coulson says his side now need to look inward and 'control the controllable'. He said: "It's important we look inward, focus on our processes and systems, control the controllable so the saying goes. "This being said, we always diligently prepare for the coming week's opponents with the players in the time we have available. "Birmingham are a physical, well coached side, with plenty of abrasive runners and no lack of skill or pace either. B&S will no doubt be looking to assert themselves early on and gain the ascendancy, as will we. In National League rugby you can be sure each week of the following, every team is motivated, well coached, combative and comes with a plan. "This is reflected upon in our preparation each week, this week is no different, as we strive to get into the points again on Saturday." On the defeat to Clifton, Coulson said they were left frustrated by the performance. He said: "Clifton were good value for their win and thoroughly deserved the five points on the day. "We struggled to exert any substantial periods of pressure and you can't expect to win at this level if you don't impose yourself consistently. While the line out functioned well in difficult conditions, we struggled to build the phases necessary to pressure them into mistakes. This realistically left us chasing the game. "Had we taken every chance we created, a four try bonus point would not have been out of the question, however we were not quite accurate enough when it mattered." Coulson added: "There were a number of positive moments on Saturday for a number of people, however they were ultimately overshadowed by the result. Individually we worked manfully and there were patches where we looked dangerous however the infrequency of these moments hampered progress." And Coulson and the rest of the Raiders coaching team know what they need to improve on to get back to winning ways. He said: "There were moments on Saturday when we were slightly off in terms of execution, we didn't quite get our timing right or just made suboptimal decisions. "These are the little things that need to be rectified if we are to primarily score points and thereafter earn the win. We will be working week long with individuals, units and in a wider team context on the technical and tactical elements that can, all being well bring success on the weekend. Four tries has to be our aim each time we take the field, knowing that if we achieve this, more often than not we will give ourselves the chance of competing for the win. "We know that there will be a vocal, enthusiastic and knowledgeable crowd at HQ on Saturday. Our supporters certainly put in the miles, some already having made trips to Taunton, Guernsey and Clifton and it's not October yet! They are a constant source of encouragement for the players. I hope Saturday is no different as we try again to make Rugby Park the best attended, atmospheric environment, providing players and spectators the best rugby experience possible." Its too early in the week for team news yet but Coulson said: "Jody and I will be speaking to the medical team throughout the coming couple of days, assessing the fitness or otherwise of the individuals and selecting the best squad for Saturday's game as we do every week."